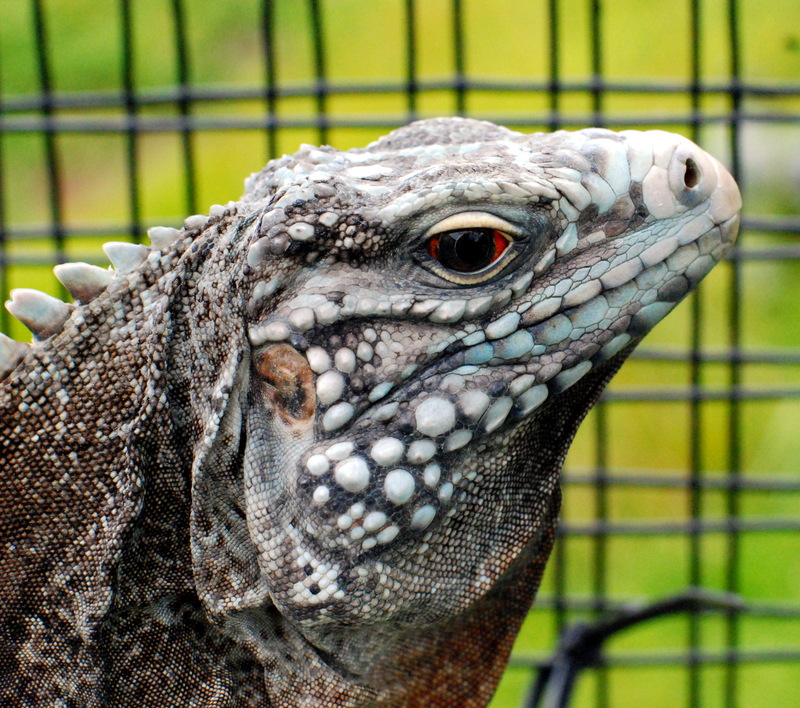 The subject of iguana snout rubbing and tearing came up when somebody mentioned that their juvenile green iguana was having outrageous outburst while in the outside cage and was running into the cage and tearing up his snout extremely bad. We also had little problem with our cyclura that scraped the snout while being inside the outdoor’s cage. So what kind of materials and methods can be used on the outside cage to prevent iguanas from hurting their snouts? Prevent snout damage. Photo by Renata Carlseen. There are couple important things to take into consideration: type of screen you are using and levels of stress of the iguana. First you want to make sure that your animal is comfortable and not stressed. If your iguana is uncomfortable outside you can try every type of screen and the screen is not the problem. The problem is an uncomfortable and stressed animal. If it was comfortable then they wouldn’t rub their nose all day. Even smooth material like glass will wear a reptiles nose off. Also a reptile that was raised indoors will get extremely uneasy when placed in the middle of the yard, especially cyclura. They like to stay very close to their hides and if anything presents a threat than they rush in it. If they have a hide box move their hide box with them. It’s like their security blanket. Than they’ll slowly come out and get comfortable with the surroundings and go in the hide box when stressed instead of rub their nose trying to get out of the cage. Of course this doesn’t always work, sometimes too much trauma, excessive heat, poor diet or just a hyper personality will have them pacing the perimeters no matter how large the enclosure or soft the screen. Lizards that have always been indoors and enclosed tend to be a bit agoraphobic at first. A hide or lair is essential for acclimating them to an outdoor cage (and always a necessity even once they’re accustomed to it). For example, the plastic “rock” lair that has an opening that lets them use it as a lair. If something startles them, they go there. As far as type of mesh material that can be used on the cage, we have been very happy with the mesh PVC-coated stainless steel with 1″ square openings. Try to select the mesh with small enough holes so the lizard can’t push the snout through them. This way they can climb the mesh, rather than trying to go through it. In the past we used plastic gardening mesh that would scrape their snouts a bit even if the animals were just slightly poking their snouts through the holes. The new steel mesh is much heavier than the old plastic mesh and makes the portable cage more difficult to move, but not horribly so. No matter how good your lighting system is, there is no real substitute for natural sunlight.